How to get dinner on the table is a universal problem for moms. 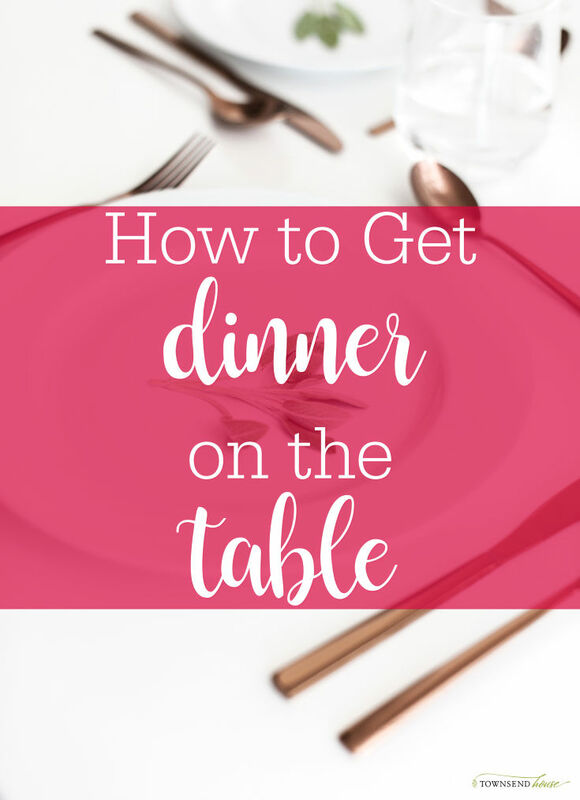 There are countless blog posts available telling you step by step how to get dinner on the table. When people think about homeschoolers time constraints aren’t at the forefront. However, how to get dinner on the table while also homeschooling? That is definitely a challenge. The first challenge is your thinking. You think you have all the time in the world because you are homeschooling. Or you feel like you have no time because you are homeschooling. There is a constant war of balance. You are home, so should be taking care of the house, right? But, you are also teaching your kids. How much time should that take? If you haven’t gone through our week on planning and margin definitely check those out before we continue. How to get dinner on the table is a universal problem. However, it can be made very easy if you have a plan. Realize that you are not going to have time for elaborate meals! Yes, there may be times for fancy dinners, but it is not often. You have chosen to homeschool. Because of that, there are other things you need to let go. I’m not saying you can never have great made from scratch meals. Just the opposite actually. Healthy, made from scratch meals, are one of the most important parts of homemaking for me. But, adjusting how they are done is important. When you think about how to get dinner on the table, you must simplify. I love to make things from scratch. I don’t have any canned beans in the house (besides refried beans). I don’t have any special mixes, or easy prepared meals right from the store. But, I do have a lot of ingredients. The problem with a lot of ingredients is that you still need the time to make the meals. Time is not always on our side. After you simplify your expectations, you need to decide on a couple very simple meals. These are meals that will most likely happen every week. This is to get you away from takeout or pizza. Those meals for us are bean burritos and breakfast burritos. Having refried beans on hand allows me to easily make a meal my kids love. If your kids hate beans, don’t choose this meal. For some reason, my kids love beans, and so we go with it! If you haven’t had luck with refried beans, or haven’t tried them with your kids, try these ones. https://amzn.to/2CczUV8 They are the favorite for my kids between texture and taste. These are quick meals that take no time to make, and my kids are guaranteed to eat. Perfect for when they have someplace to be in the evenings. Or if you have been busy during the day. Let go of the guilt. How to get dinner on the table is hard for everyone. But let go of the guilt associated with your meals. It takes a long time to get into a good meal rhythm. We use our freezer a lot for this. When you make one dinner, it is almost as easy to make a second dinner and put it in the freezer. You don’t need to spend an entire day doing freezer meals. In fact, I’m not a huge fan of the freezer meals you see because they aren’t that healthy. But, if you make a huge crock pot full of chili, put some in the freezer for a couple weeks from now. If you make one homemade mac and cheese, make enough sauce and noodles to stick a second one in the freezer. If you are making chicken tacos, have a freezer bag available and put the ingredients for another crock pot recipe into the freezer to have when you need it. This will slowly build up your freezer with healthy food that your family enjoys. This makes getting dinner on the table so much easier. Just remember to take food out of the freezer the night before! A perfect addition to your evening routine. When you think about how to get dinner on the table, meal planning comes up. To be honest, I am horrible at meal planning. The reason? I enjoy cooking by inspiration. What are you inspired to cook today? If the menu says one thing, more often than not I don’t want that meal. This I think is part of my rebel tendency https://amzn.to/2CgCHNm. It isn’t a bad thing, just something I need to work around. If you enjoy meal planning, you already know how to get dinner on the table. Follow your meal plan. But, for the rest of us, make a meal list. Several years ago I made a list of all the meals my family would eat. The caveat being that those meals were always able to be prepared. This meant that I kept up a pantry full of ingredients that could be used to make different meals on a moment’s notice. Things like spices, flour, sugar, crushed tomatoes, rice etc. The night before, I can look at the list, see if I need to take something out of the freezer to thaw, and then easily prepare a meal the next day. The final tip I have on how to get dinner on the table is simple: leftovers. Now, I know that a lot of people do not like to eat the same thing over and over again. If this is you, you may not like this tip! I tend to make large batches of meals. Partly so they can be put in the freezer for later, partly because it takes a load off of me during the week. The leftovers can easily be used for lunches and/or dinners during the week. If I make a big pot of chili on Sunday for the football game, you better believe we will have that for dinner again at some point during the week. The key with leftovers is for it to be something your family loves. This works in the fall and winter because it is soup/stew/chili weather. This is the trick I use for how to get dinner on the table. I make sure my family will eat leftovers. That’s not to say that you only make one meal each week and that is it. But, you have to be able to balance your time between homeschooling and homemaking. If that means leftovers a couple nights a week, that is OK! Don’t beat yourself up about it. And if people in your family complain about what they are eating, guess what, they get to make the next meal. Homeschooling is a lifestyle choice. It is also a full-time job. If you want to know how to get dinner on the table, you have to be willing to cut back on certain things – like a fully made from scratch meal every night. It doesn’t have to be unhealthy just because it came from the freezer. And it doesn’t have to cost a lot of money either. You can make healthy, economical meals that your family loves without worrying about the time involved. Sit down with your family and make a meal list. Figure out the ingredients that you use over and over again and make sure those are in your pantry. Are there certain meats that your family prefers? Look for sales and stick them in the freezer for later. Above all else, don’t feel guilty if you don’t know how to get dinner on the table. Start slowly. Make a little bit extra so that you have something to put in the freezer, or will have leftovers. Do you struggle with how to get dinner on the table? What tips would you share?